Node positioning and mobility is important for many simulation scenarios, especially those involving wireless communication. In INET, mobility is added to nodes in the form of modules that represent mobility models, such as linear motion or random waypoint. A large number of mobility models have been provided with INET, and they can also be combined to achieve more complex motion. This showcase demonstrates some of the available elementary mobility models. Combining mobility models is covered in another showcase, Combining Mobility Models. Mobility models are mostly used to describe the motion of wireless network nodes. In wireless networks, the signal strength depends on the position and orientation of transmitting and receiving nodes, which in turn determines the success of packet reception. Because of this, position is always relevant, even if the simulation is run without a GUI. In INET, mobility is added to nodes in the form of modules that represent mobility models. Mobility module types implement the IMobility module interface, and are in the inet.mobility package. 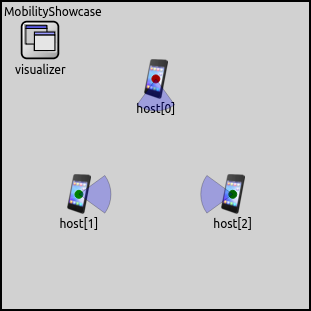 This showcase presents an example for most of the frequently used mobility models. Mobility models can be categorized in numerous different ways (see User’s Guide), but here we present them organized in two groups: ones describing proper motion and/or dynamic orientation, and ones describing the placement and orientation of stationary nodes. For the interested reader, the INET User’s Guide contains a more in-depth treatment of mobility models. 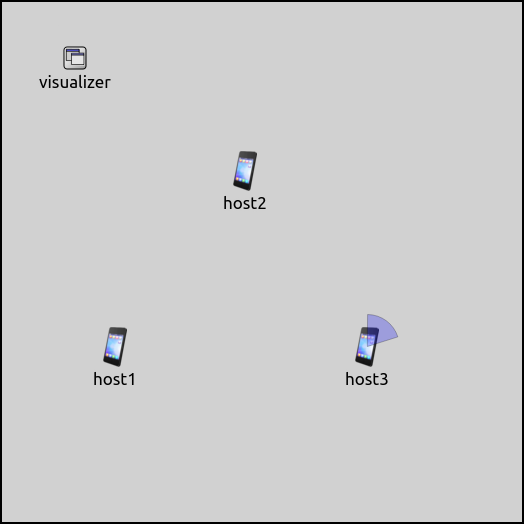 All visualization features of MobilityVisualizer are turned on, and the constraint areas of all mobility modules are set to match the size of the scene. All nodes will move in the XY plane, so the Z coordinate is always set to 0. The model does not need a network configurator module because there is no communication between the hosts, so we set the configurator module path in the hosts to the empty string. This section covers mobility models that define motion. Such models in INET include: AnsimMobility, BonnMotionMobility, ChiangMobility, CircleMobility, FacingMobility, GaussMarkovMobility, LinearMobility, MassMobility, Ns2MotionMobility, RandomWaypointMobility, RectangleMobility, TractorMobility, TurtleMobility, and VehicleMobility. 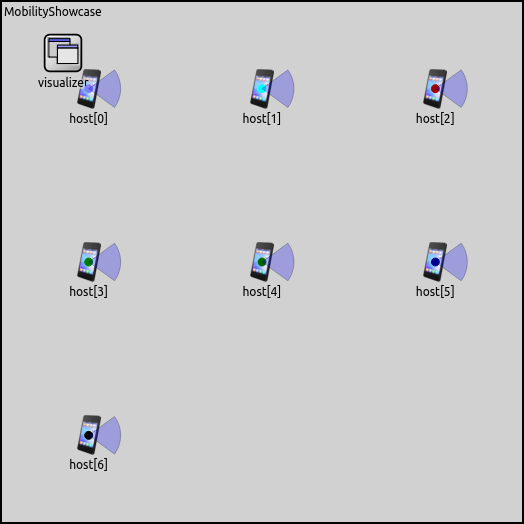 Some of these mobility models are introduced by the following example simulations. The LinearMobility module describes linear motion with a constant speed or constant acceleration. As such, it has parameters for speed, acceleration and starting angle. The model also has parameters for initial positioning (initialX, initialY, initialZ), which, by default, are random values inside the constraint area. We leave both acceleration and angle on their default values, which is zero for acceleration and a random value for the angle. The video shows that the seven hosts are placed randomly on the scene with a random starting angle. They all move along a straight line with a constant speed. They also bounce back from the boundaries of the constraint area when they reach it. TurtleMobility is a programmable mobility model, where the “program” is provided in the form of an XML script. The script can contain commands that set the position and speed, turn by some specified angle, travel a certain distance, etc. These motion elements can be used as building blocks for describing various motion patterns. GaussMarkovMobility model uses the Gauss-Markov mobility model that involves random elements when describing the motion. It has an alpha parameter which can run from 0 (totally random motion) to 1 (deterministic linear motion), with the default value of 0.5. The random variable has a mean of 0, and its variance can be set by the variance parameter. The margin parameter adds a margin to the boundaries of the constraint area, so that the mobility bounces back before reaching it. The mobility module is set to totally random motion, with a variance of 0.5. FacingMobility only affects orientation: it sets the orientation of the mobility module to face towards another mobility module. More precisely, the orientation is set to point from a source mobility module to a target mobility module. Both can be selected by the sourceMobility and targetMobility parameters. By default, the sourceMobility parameter is the mobility module itself. The targetMobility parameter has no default value. Note that this screenshot is not from the example simulation, it is just for illustration. The BonnMotionMobility mobility model is a trace-based mobility model, which means that node trajectories come from a pre-recorded trace file. The BonnMotionMobility uses the native file format of the BonnMotion simulation tool. The file is a plain text file, where every line describes the motion of one host. The nodeId parameter selects the line in the trace file for the given mobility module. The value -1 gets substituted to the parent module’s index. If we take host for example, it gets the first line of the file. It stays at the position (100,100) for 1 second, then moves to the point (175,100) on a straight line and gets there at t=3s, etc. The following mobility models define only the stationary position and initial orientation: StaticGridMobility, StaticConcentricMobility, StaticLinearMobility, StationaryMobility. The example simulation is run with seven hosts. StaticGridMobility positions all nodes in a rectangular grid. It has parameters for setting the properties of the grid, such as a margin, the number of row and columns, and the separation between rows and columns. By default grid has the same aspect ratio as the available space (constraint area by default). 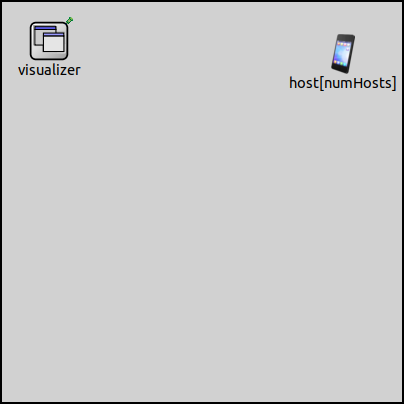 The numHosts parameter must be set in all mobility modules of the group. The StationaryMobility model only sets position. It has initialX, initialY, initialZ and initFromDisplayString parameters. By default, the initFromDisplayString parameter is true, and the initial coordinate parameters select a random value inside the constraint area. Additionally, there are parameters to set the initial heading, elevation and bank (i.e. orientation in 3D), all zero by default. Note that StationaryMobility is the default mobility model in WirelessHost and derivatives.